Creation Date Friday, 28 March 2014. In one of their latest publications, Professor Eugene Cloete, Vice Rector of Research and Innovation at the University of Stellenbosch, reiterated that the three primary factors of water filtration, namely: pollutant remediation, detection and prevention, are actually influenced by nano materials. Cloete explained that nanotechnology could aid in maintaining the quality, availability, and viability of water resources in a long-term basis through advanced filtration materials that enable greater water reuse, recycling, and desalinization. More and more industry professionals are starting to recognize the positive impact of nanoscience and its advances in the area of water and wastewater treatment. With its capacity to engineer matter at a molecular scale of roughly 1 to 100 nanometers, industrial water purification companies had started using viable nanostructures including reverse osmosis membranes, nanotechnology-based adsorbents, ion-exchange resins, as well as desalination and coagulation techniques in their water treatment systems. These nano structured membranes and adsorbents also proved to play a pivotal role in some of the industry's most efficient purification methods by effectively separating and filtering suspended solids and other chemical effluents on a miniature level in water. Once commercialized, these nanostructured applications, including nanotechnology-based absorbents, reverse osmosis membranes, and ion-exchange resins, can pave the way towards quicker, more efficient and economical, water and wastewater treatment. The South African Water Research Commission attested the versatility of nanoscience as it encompasses a broad range of scientific studies including chemistry, physics, biotechnology, and engineering in working towards improving water quality. Federal research and development teams also found that the distinctive high separation efficiency of nanotechnology in toxic elements like arsenic and mercury, can be used by water industry professionals and consumers in the water purification process. Further, the emergence of nanotechnology can potentially reduce water costs with relatively inexpensive purification methods that can foster global water resource conversation. The technology provides advantages for developing countries including environment preservation, infrastructure enhancement, and overall life quality improvement. 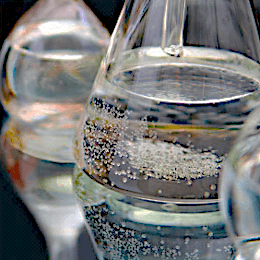 To ensure the quality and purity of water resources used in diverse industries, Aqua Solutions provides industrial-grade water purification systems engineered to produce ultra-pure reagent grade water for scientific laboratories across the globe. Learn more about Aqua Solutions' full line of premium-quality water treatment technologies at www.aquaa.com today.